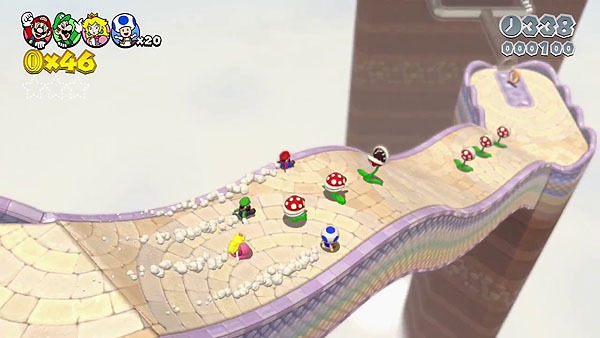 This might not be the Wii U Mario game that Nintendo fans might be looking for but it looks like a fun entry that's a bit bigger than New Super Mario Bros. U. Similar to Super Mario 3D Land for the 3DS, Super Mario 3D World is basically the same game only made bigger since it's on the Wii U. With up to 4 players for some zany and frantic Mario Bros. mayhem, they might seem a bit familiar. Instead of having two random Toads fill in the 3 and 4 player spot, Princess Peach has returned to the roster. Much like Super Mario Bros. 2 (the Doki Doki Panic one), Luigi has his floaty jump, Peach can hover in the air for a few seconds and Toad can run faster. A new power up has also been included. Grabbing a bell will transform Mario into Cat Mario which lets him run up walls and do a dive pounce from mid-air. Though not the most original of Nintendo games, you can be assured that this game will still have a lot of polish and will be fun to play with friends and family. Plus that new overworld theme is just so catchy. Super Mario 3D World will be available for the Wii U in December of this year.